We will pretend not to notice that my brother managed to take the pictures with the color jog in the front. I knit this a while back, while I was home for Thanksgiving, using US 7 needles and colorways Chestnut, Lettuce, and Olive. 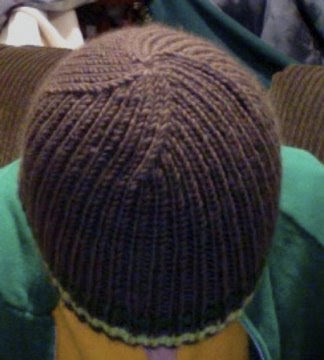 I CO 84 stitches (I think) and knit until it fit my brother's head, and then I decreased the top. Simple enough. It seems that I am unable to knit just one Malabrigo hat at a time (they're like Pringles), and so I introduce yet another hat. 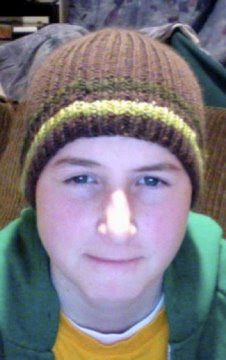 This hat and the following project were knit in lieu of studying for finals. Don't get me wrong, I did in fact prepare for my finals, I just feel like any time spent doing anything else was taking away from the time I could have used to study, but let's face it, one can only cram one's head with useless information that will soon be forgotten for so many hours a day. 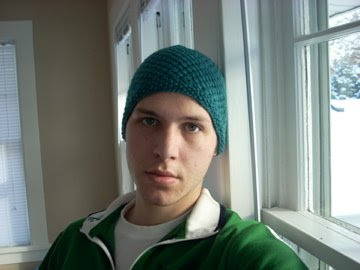 I am tempted to say that the Armando Hat is the last beanie I will be making for a while now. I really just don't like them, yet I continue to make them for what I assume is the sheer joy of knitting with Malabrigo. I must control myself. 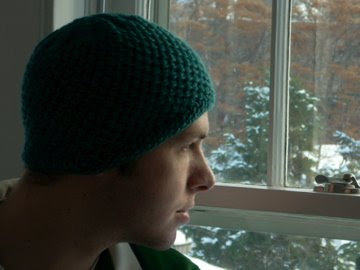 Hats, as I have recently learned, are not the only things one can make with Malabrigo. Almost anything can be knit with this wonder-yarn (don't worry, I do not plan to coin that phrase or ever use it again). Her: I love your knitting! Her: By the way, I have a birthday at the end of December and I love warm things! Very subtle indeed. 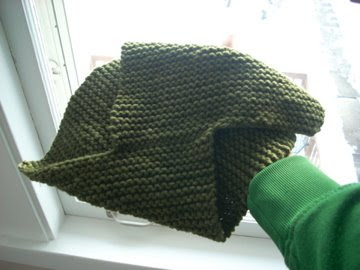 I knit her a hat out of Malabrigo Chunky (which I forgot to take a finished picture of before I gave it to her) and now knit this neck warmer out of the same yarn (Chunky in Olive) to go with it. The pattern is the Wham Bam Thank You Lamb! 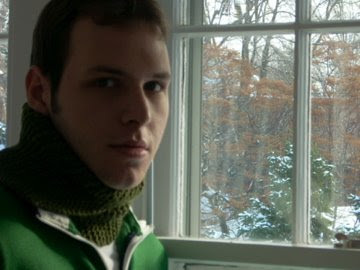 Neckwarmer (rav link) and may be the world's simplest pattern. It went like this: I knit a large rectangular swatch in garter stitch and seamed it as shown above. Genius! My friend is of the sort who wears scarves all year long wrapped around her neck, so I'm hoping this will be right up her alley. You can't go wrong with Elizabeth Zimmermann. I was so excited about this book! 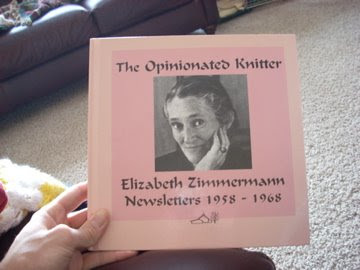 I own her Knitting Workshop and am extremely excited to start a project or two out of this book as well. There was also this mitten book. My sister, at the time that she ordered it, didn't realize that it wasn't in english. I don't think it'll be much of a problem though because there is only a short introduction and then the rest of the book is stuffed full of really cool charts. There's gotta be hundreds of patterns in this book. Check out this really cool knitting tool. 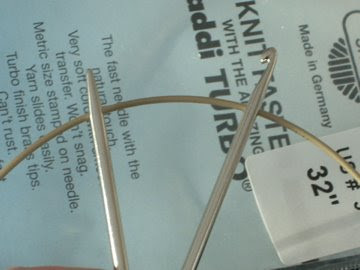 Apparently they aren't even made anymore (I don't know how my sister managed to find one), but it's an Addi Turbo Cro-needle. It has a crochet hook on one end of the cable and a knitting needle on the other, which will really make picking up stitches extremely easy. There was also, of course, yarn in the package. 1200 yards of laceweight merino from The Woolen Rabbit in Mystic Mountain Pine. The yarn is to go along with the pattern that was also included in this unbelievable gift for the Autumn Arbor Stole. I'm so excited to get started on this, but it's going to have to wait for quite a while. 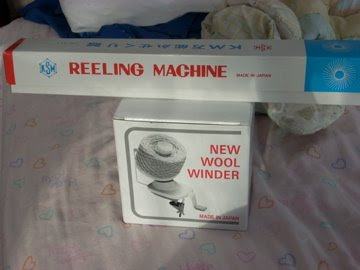 To top it all off, there was also a ball winder and swift! I really don't think a birthday gift could have gotten any better. Oh, to top it off again, my sister included the 2009 Men With Yarn Calendar. I think that's enough of an update for now, I don't want to tire you all out! HOW did you get Mark to take a picture??? I'm still waiting on one of him in the sweater I made...LAST SPRING!!!!! HAPPY BIRFDAY! :) I hate that I missed that. The hats look great! I think you're officially a Mal Junkie now. Enjoy the holiday break! First of all, WHATSUP STUD!? the cowl picture made that response absolutely necessary, you are totally rocking it. Happy belated birthday, I'd imagine all of those gifts made you quite the happy knitter! i like that beanie, might have to add it to my queue. happy birthday, you seriously cleaned up for it! Wow, what wonderful gifts! I hope you enjoyed your 21st. Great knitting, too. I especially love the neck warmer. I may have to try that one. Happy way-belated Birthday! What a great set of birthday gifts! What language is the mitten book in? 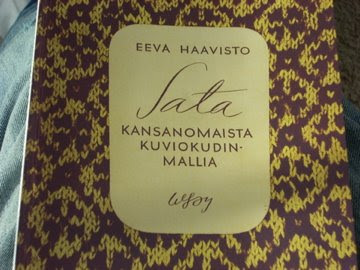 Estonian? 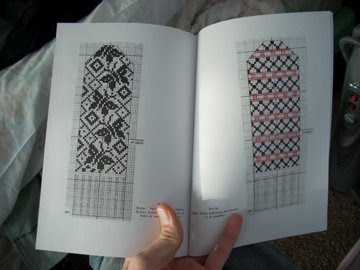 I would have a blast with a knitting book in another language (but then again, I'm a total language dork). 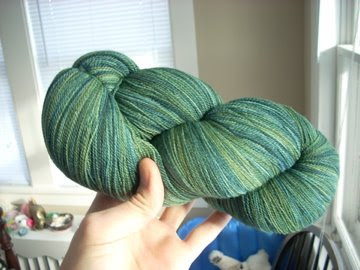 I can totally understand the Malabrigo love. It's amazing stuff. Gosh. Your family is so supportive of your habit!